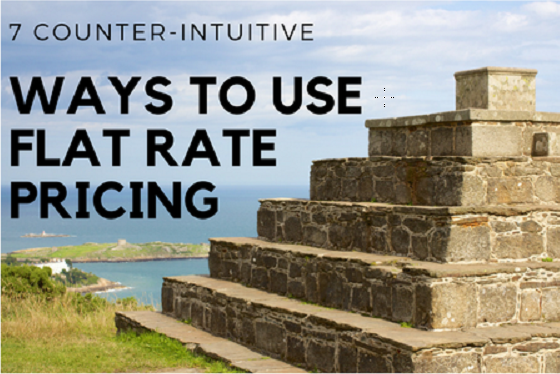 The pricing method that will bring in the revenues and profits you deserve is called flat rate pricing. However, when instituting a flat fee policy, it is easy to stumble on the various pitfalls that exist which will seriously harm your bottom line. The following guidelines are essential to maximizing your pricing policy to run a successful service business. Never apologize for the investment to provide great service. If you were a warehouse outlet of parts, your business model would be based upon buying wholesale and reselling massive amounts of parts (many of them small and inexpensive) which you sell to a steady stream of customers. Your clientele includes solo home contracting providers, do-it-yourselfers, and large service companies with a team of employees. Your revenue would depend upon a tremendous consumer base for parts or every size and type. Your business would rely on selling so many parts that with the relatively modest markup allowable, you still earn solid profits. But as a residential service professional, you are not in that business. The parts you provide to fix your customers’ issues are actually a very small part of the service you offer. In fact, I like to say the parts are FREE as long as you purchase my service. Let’s put it this way, if you showed up at the customer’s house and they handed you a box with the necessary valves, pipes, coupling, O-rings and joint washer, you would still be doing them an enormous service by assembling, installing, tightening and otherwise using those parts in the proper manner to provide safety, health, quality and reliability. To the average homeowner, trying to do the hvac, electrical or plumbing fix themselves would be like repairing the engine on an Apollo space rocket. The interest and concern you show for their family, work and personal lives, the comprehensive thinking you show in terms of systems upgrades and household improvements, and the adaptive expertise you show in terms of solving problems (which includes talking about parts as specific solutions, not as 5-digit part numbers). You as the service person provide the highest value for the price. All of this makes your flat fee prices worth every penny. Too many companies, when instituting a flat fee policy, set up a highly formalized structure whereby every kind of service job is micro-described (and micro-managed) in the company’s literature and computer systems, which applies even to the parts purchasing department. Specificity and details are great, in general, when presenting solutions to the customer, but it can go too far. Especially on the back end, when your flat fee system means that new parts are automatically ordered based upon the jobs which techs are sent out on. Often the tech in the field will buy a special part himself, or have an extra on hand in his truck, or be able to use a slightly different part which works just as well in the practical, hands-on situation. Your service techs need to be allowed for on-the-spot, flexible solutions and sometimes that means specific parts which are perfect for the job but can’t fit into a pre-set cookie cutter requisition. If your company automatically orders parts based solely on what suggestions are in your flat fee options, you will likely find yourself wasting a lot of money on parts that stack up in your storeroom. The ordering of parts should be a constant, closely monitored process based on what’s really being used, and not set in stone based on a job template. When going to flat fee pricing, many service companies go “task crazy”. By that I mean they brainstorm 1,000 tasks to go in the tech’s pricing book, thinking that it’s better to over-list the priced tasks than under-list them. They’re wrong. I admire the initiative and effort, but if you fill your techs’ price books with hundreds and hundreds of tasks, they’ll get overwhelmed, intimidated and stop searching the book in earnest. They will instead head towards their go-to tasks that they already feel comfortable with. This will cause an inaccuracy between the tasks they do for the customer and what’s actually needed. The answer is for you to have the service tasks be specific and differentiated but don’t go way overboard and have 100 different options of the same basic valve replacement, with a different task for each specific valve. Have a single flat fee task that covers all straightforward valve replacements and allow the tech to adjust the part specifics in each individual case. It’s better to have a streamlined price book than an overstuffed one that techs hate and don’t want to really use. Your new flat rate pricing book goes hand-in-hand with the pure motive service I’ve talked about in previous articles. This means not only offering multiple options to a customer but understanding and explaining the high-value proposition on each and every call. These aren’t just empty words, this is a mindset of superior service which translates into actual reality the customer can feel and perceive. Your techs need to customize options and create complete solutions for customers. You need to offer genuinely personal, adaptive and case-by-case service for each homeowner and the particulars of their home and lifestyle. If the tech just says “These tasks all come from the most authoritative flat fee resources” the customer is going to feel that they’re being sold some kind of exploitative, high-profit bill of goods. Putting together a mixed task solution after listening and analyzing the client’s needs is excellent service. You can additionally train your techs in creating presentation sheets that illustrate the benefits to the customer’s household. 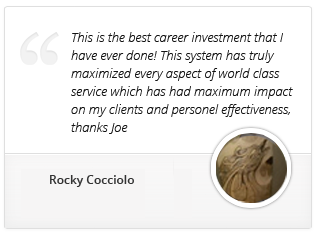 Simply let each client know WHY you chose the prices you did and how they will benefit and you will always win. What he should do instead is offer a variety of upgrades and other repairs. That way the customer is truly being informed of the state of their home systems and given options for different levels of service. When techs don’t do the latter, the company will often get phone calls complaining of other issues- renovations, repairs, replacements- that were left undone. Your techs need to be able to come up with structured pricing options in the field, and quickly. Every customer should be given option sheets with premium, mid-range and economy choices so that they experience a bounty of possible solutions. Whether more expensive and comprehensive or less expensive and stripped down, each option should be backed by integrity and expertise. Your tech is ultimately not choosing for your client, but allowing THEM to choose which solution they will purchase. Giving choices IS the American way! We’ve established that your flat rate price book is a fantastic tool and an enormous asset which, when used correctly, leads to vastly increased revenues and profits. But the book can also boomerang on you and your company if not created and maintained correctly. Using the traditional publishing methods, once all of the information is gathered, organized, proofed and printed, mistakes and errors will pop up with some item details and prices being erroneous. Field service techs will see these discrepancies in the document, feel awkward and put on the spot, and quickly lose confidence in it as a resource on service calls. The flat rate book becomes worthless when your field techs don’t trust it. You must have two-way communication with everyone in the company and especially your field techs to be constantly correcting and updating your flat rate book. In addition to simple errors which humans make, there is the issue of real world prices of parts changing anyway. Also the invention of new home service technologies which need to be integrated into the book. There now exist electronic publishing and delivery methods that allow your flat fee book to be a living, evolving document. This will help you to avoid major pitfalls and keep your techs and customers happy and successful for many years to come.